More than £440,000 has been raised in Northern Ireland for the BBC's Children in Need appeal. The overall total after Friday night's event was £15,305,212 - beating the previous record of £13.5m raised last year. 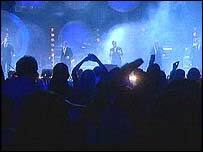 Westlife, Girls Aloud and Simply Red were among the entertainers performing at the Odyssey Arena in Belfast. Proceeds will go towards helping young people affected by homelessness, HIV, sexual abuse and drug addiction. Northern Ireland Children in Need co-ordinator Sheila Jane Mallie praised those who had contributed to the appeal. "It has been a really brilliant night - the phones have been going non-stop and people have been brilliantly generous," she said. "I would say that we have had more phone calls than in previous years, and the concert has been just wonderful." Thousands of people and businesses have been holding their own fundraising events for the annual appeal. The final total last year, after all donations had been counted, was more than £26m. 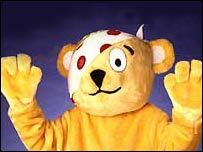 BBC Children in Need started in 1980, and has raised more than £325 million. "People across Northern Ireland took time out to raise money for disadvantaged children throughout the week"